Helichrysum rupestre var. melitense Pignatti. Taxonomic Note: According to the most recent revisions on the genus Helichrysum in Europe, H. melitense should be included and hence synonymised with H. rupestre (Raf.) DC. The latter taxon was later found to be illegitimate, and therefore the Maltese plants are currently placed under the name H. panormitanum Guss. Stevens, D. & Lanfranco, E. 2006. Helichrysum melitense. The IUCN Red List of Threatened Species 2006: e.T61623A12525568. http://dx.doi.org/10.2305/IUCN.UK.2006.RLTS.T61623A12525568.en. Mifsud S., 2013. 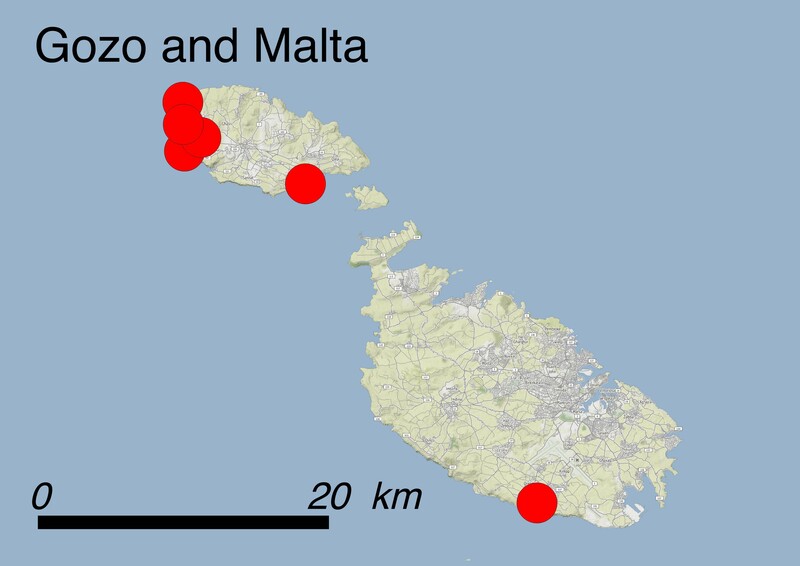 Distribution of some rare or endemic chasmophytic and rupestral species growing along the coastal cliffs of the Maltese Islands. Webbia, 68(1):35-50. The main population of Helichrysum melitense is found on sheer faces of the western cliffs (Habitat 13.1: Sea cliffs and Rocky Offshore Islands) of Gozo including Ħaġret il-Ġeneral (the Fungus Rock Nature Reserve). 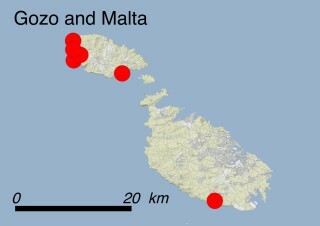 A few isolated, small populations are also present inland in western Gozo, on the southern coast of Gozo as well as on the southern coast of Malta. The species was also present along the south-western coast of the island of Malta at the beginning of the 20th century, but has not been reliably found for almost a century and hence needs to be confirmed. Most plants are found on shelves, natural cavities and ledges on limestones. They colonize the upper parts of vertical cliffs, but some spread horizontally on top of the cliffs, up to ca. 100 m inland (e.g. Inland Sea/Azure Window area). 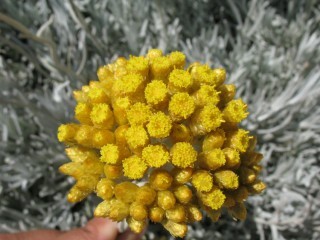 The Maltese Everlasting is easily recognised, as it is a rupicolous shrub with silvery green foliage and a dense inflorescence of bright yellow composite flowerheads, appearing in late spring to early summer. The shrubs normally measure 50-150 cm in diameter and have lanceolate leaves covered by dense woolly hairs. At the end of May, a compact inflorescence is produced from each branch forming clusters of small but conspicuous, pale-yellow flowerheads. The papery nature of the involucral bracts permits them to retain their colour almost for two months. The tiny achenes develop in mid-summer and bear a parachute-like appendage (pappus) to facilitate wind dispersal. H. melitense is related to the curry plant (Helichrysum italicum) and in fact its fruit emit a curry-like odour when crushed. Owing to their bright yellow flowers which last for several weeks, the Maltese everlasting is nowadays widely cultivated for ornamental use, especially in Gozo. Closely related Helichrysum species have medicinal properties for the treatment of asthma and rheumatism, and research carried out on H. melitense may yield similar active principles. The main population is found along an 8 km stretch of cliff, from Wied Milied (Għarb) to Tat-Tinewt (Kercem). In this new assessment, small populations discovered a few years ago at Għajn Abdul (San Lawrenz) and Xatt l-Aħmar (Għajnsielem) in Gozo, as well as the population from Wied Babu (Żurrieq) in mainland Malta, have also been included. The latter population has not been recorded for some decades, but being located in inaccessible pockets, it may still be extant and is hence considered in this re-assessment. The resulting EOO is 107 km2 and the AOO is 24 km2. The population is severely fragmented, with only one main subpopulation along the western coasts of Gozo, another in the southeast of Gozo and one on Malta, and as a whole the species is represented by approximately 5000 individuals. As a result, the species is threatened with Category EN (Endangered) according to IUCN Red List Criteria B1ab(i,ii,iii,iv)+2ab(i,ii,iii,iv). With most of the populations being found on sheer cliffs, only a few minor threats are of anthropogenic origin. These include localised quarrying fracturing the cliff faces (threat 3.2: Mining and Quarrying) and resulting dust pollution (threat 9.5: Air-borne pollutants), dumping of solid waste (threat 9.4: Garbage and solid waste) and land reclamation for farming or bird trapping (threat 2.1.2: Small-holder farming). Since the tourist attractions of the Azure Window and Inland Sea lie within the range of the population, the plants located on the cliff plateaus face a high risk due to human pressure (threat 6.1: recreational activities), and the impact of introduced alien species (threat 8.1.2), particularly Carpobrotus edulis, but these threats touch only a small fraction of the entire population. Cliff collapses due to local geology (threat 10.3: Avalanches/Landslides) could represent a serious threat but such stochastic events are highly infrequent, and would not be expected to affect the entire population considering the presence of inland stations at different locations along the western coast of Gozo. Localised natural landslides and rockfall take place at a small scale, and the resulting new cliff faces are slowly repopulated by neighbouring plants. Legally: Internationally, this species is listed in Annexes II and IV of the 92/43/EEC Directive as a priority species, and in Appendix I (Strictly Protected Flora) of the Bern Convention. The species co-occurs on local cliffs and boulder screes (the so-called rdum) together with several other Maltese endemic and sub-endemic plants. The majority of the areas occupied by this habitat type is protected as a Site of Community Importance and/or Special Protection Area as part of the EU Natura 2000 Network. Nationally, H. melitense is protected by 92/43 EU Directive Regulations, 2006 (Legal Notice 311 of 2006 as amended). All cliffs on Malta and some cliffs on Gozo are also protected and/or scheduled in terms of environmental and/or spatial planning legislation, either as Special Areas of Conservation, Special Protection Areas, Sites of Scientific Importance and/or Areas of Ecological Importance. The islet known as Ħaġret il-Ġeneral (Fungus Rock), where this species is reported to occur, is a Nature Reserve where access is forbidden, except for valid scientific reasons. In situ: The species is part of the Surveillance and Monitoring Programme of the Environment and Resources Authority, aiming at assessing the conservation status of the species at regular intervals by checking the trends of the distribution range of the populations and the quality of the habitat occupied by the species, as well as ongoing pressures and threats and their intensity. Reports summarising these assessments are produced every six years. Management plans for the protected areas where this species occurs have been approved by the Authority responsible for environment protection in Malta. Such management plans also include specific actions aiming at the conservation of the species and its habitat. Some of these sites were also subject to EU funding, through European Agricultural Funds for Rural Development (EAFRD) and LIFE Projects although the funding was not directly focused on this species, but on the sites where it lives or on other co-occurring species (like seabirds). Moreover, activities, plans and projects affecting the area of occupancy of the species within Natura 2000 sites are subject to environmental impact assessment procedures as detailed by 92/43 EU Directive Regulations on behalf of the Environment and Resources Authority. Ex situ: Cuttings of plants collected from Dwejra (western Gozo) were planted at the Botanical Garden of the University of Malta both for ex situ conservation and ornamental purposes. H. melitense has also been propagated at the former Plant Biotechnology Centre of Malta, using micropropagation techniques as part of a joint research programme with the Department of Biology of the University of Malta. Due to its ornamental nature (colour of the foliage and ‘everlasting’ flowers) and its limited need of water, the Maltese Everlasting has also been introduced to cultivation and has since became one of the most commonly cultivated ornamental plants of Gozo. Since most of these planted individuals are not able to produce offspring, their effect on the IUCN risk assessment should be considered as negligible. Since most of the cliffs fall within local Natura 2000 sites and the species is legally strictly protected, the most effective conservation measures needed are to ensure better compliance and enforcement of legislation, particularly in relation to quarrying activities, abseiling, land reclamation, and illegal dumping; as well as the provision of funds to enable an appropriate implementation of the management plans;. In this respect, the eradication and/or control of invasive alien species acting as pressures and threats to this species should be promoted further, with urgent measures to be taken against further invasion of Carpobrotus spp. within the distribution range of the species. Moreover, access to the top of the Azure Window and the surrounding areas by tourists and other visitors should be controlled and minimized to safeguard and perhaps encourage the expansion of plants on the cliff plateaus. Maintenance of surveillance and monitoring of the species and/or the sites where this species occurs is required, with an added effort to confirm the ancient and to check the recent unconfirmed reports for the southern cliffs of the island of Malta. Moreover, further research to understand the ecology and distribution of the Maltese rdum communities, and the germination and growth requirements of the species is needed, as well as further promotion of ex-situ conservation measures. Stephen Mifsud, EcoGozo regional development directorate, Malta. Darrin T. Stevens, Environment and Resources Authority, Malta. Edwin Lanfranco, Institute of Earth Systems, University of Malta, Malta. Sandro Lanfranco, Department of Biology, University of Malta, Malta.